On Thursday, we hit the Rome train station bright and early. 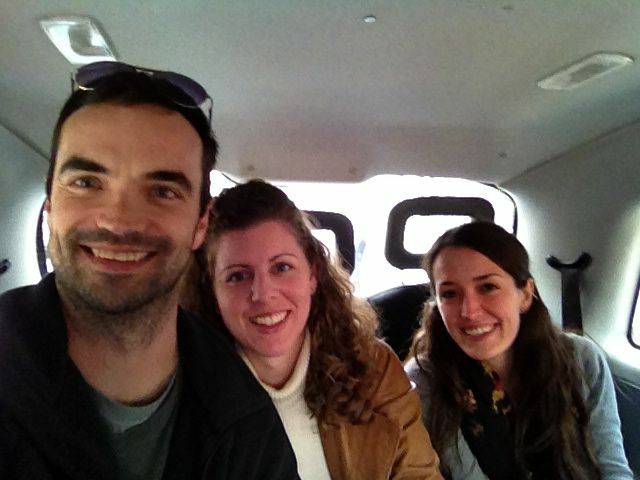 Our plan was to head back to Florence to meet Ashley, and then the three of us would take a train to Pisa, fly into Gatwick, and take the Tube into London. Checking out of our hotel in Rome. 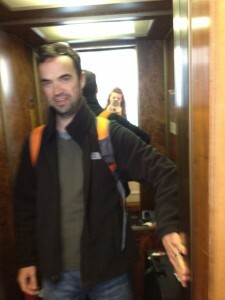 The elevator barely fit us and our luggage! Unfortunately, our plans changed a bit when the train from Rome got delayed and we missed our connection in Florence. That left us scrambling for another route to Pisa, and we weren’t sure where Ashley was since our phones didn’t work overseas. Robby figured out that we could get to Pisa in time for our flight if we took two different trains, so that’s what we did. We made it to the Pisa airport, checked in for our flight, and then wandered around, looking for Ashley. 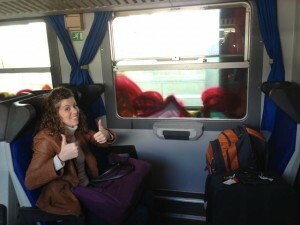 We eventually bumped into her, and discovered that we had been on the same Florence-to-Pisa train! When she saw that our train from Rome was delayed, she decided not to get on the original train, and ended up taking the same detour we did. 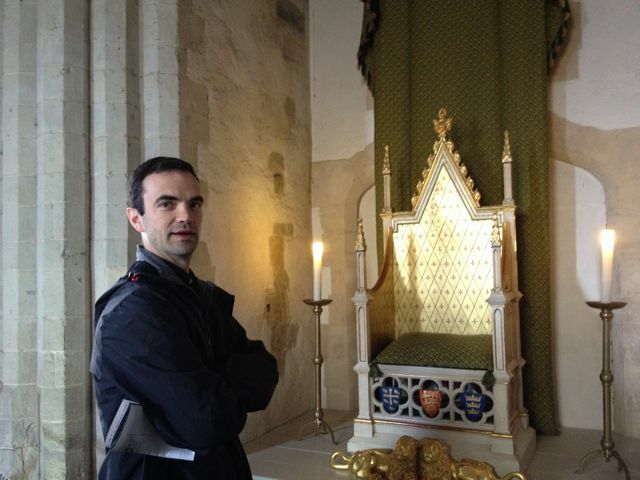 Eventually, we all got on the flight and made it to London uneventfully. London was cold and drizzly as we made our way to Victoria station on the train. 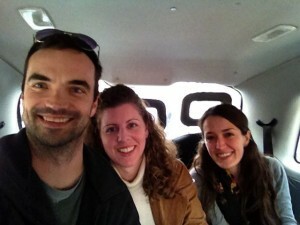 We didn’t want to walk to our hotel in the rain, so we hailed a classic British taxi! We were pleasantly surprised to find that our hotel was new, gorgeous, and super modern. 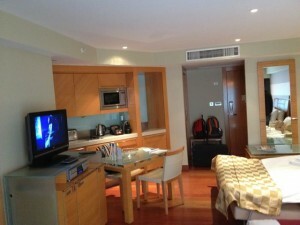 Our room had a full kitchen, free gourmet snacks and drinks, and even a washer-dryer! Best of all, Robby found a deal online, so we paid less than half of the standard (super high) room rate. After checking in and resting for a bit, we decided to venture out for dinner and some sightseeing. 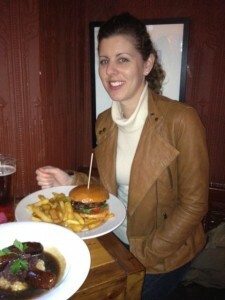 We found a great little pub and loaded up on burgers, bangers & mash, and beer. Then we made a big walking loop around the West End, from Big Ben and Parliament to Buckingham Palace. We ended up near the London Eye, and on impulse we decided to take a ride. 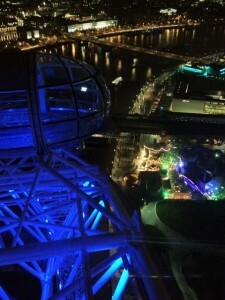 It was scary, but the views were amazing! 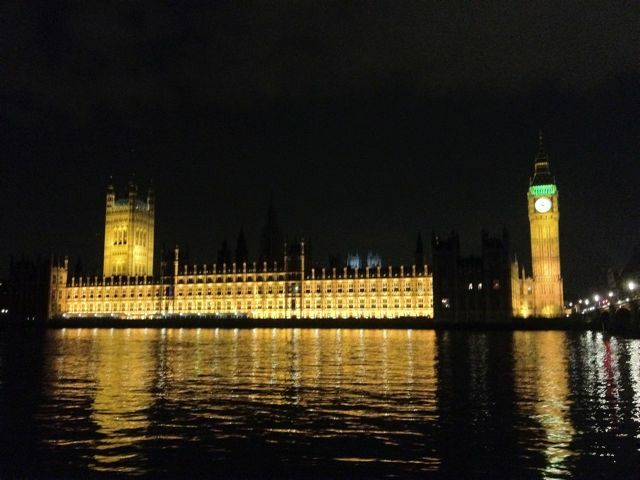 Big Ben and Parliament at night. 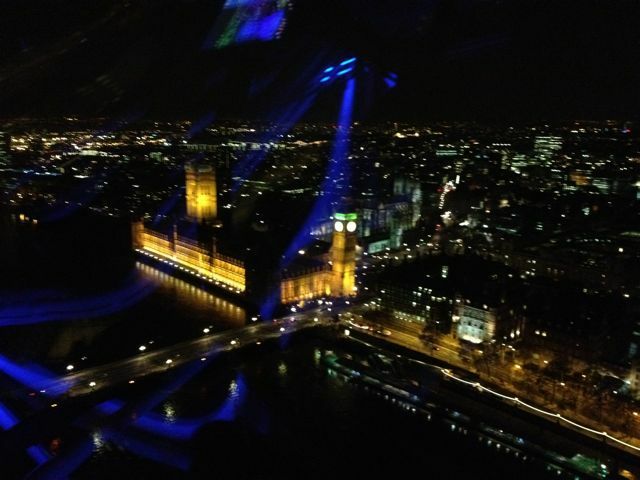 View of London from the top of the Eye. After our late-night “flight” on the London Eye, we headed back to our hotel for some much-needed sleep. 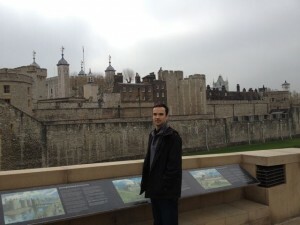 Friday morning, we woke up early, hunted down some coffee and pastries for breakfast, and took the Tube to the Tower of London. 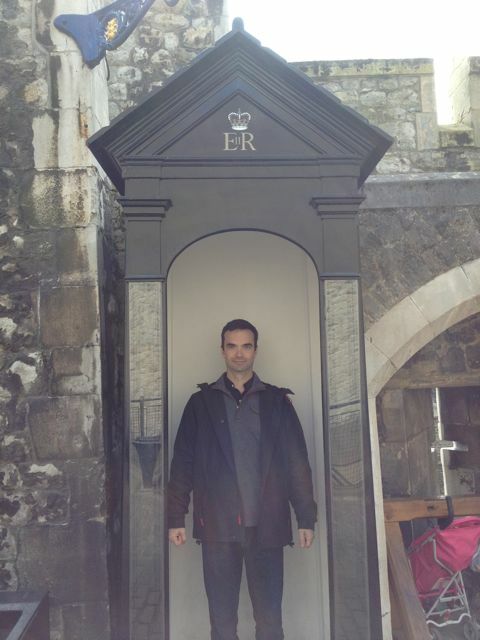 We spent several hours exploring the Tower, from the Crown Jewels to the Armory. Robby was especially enthralled! View of the Tower Bridge from the walls of the Tower of London. 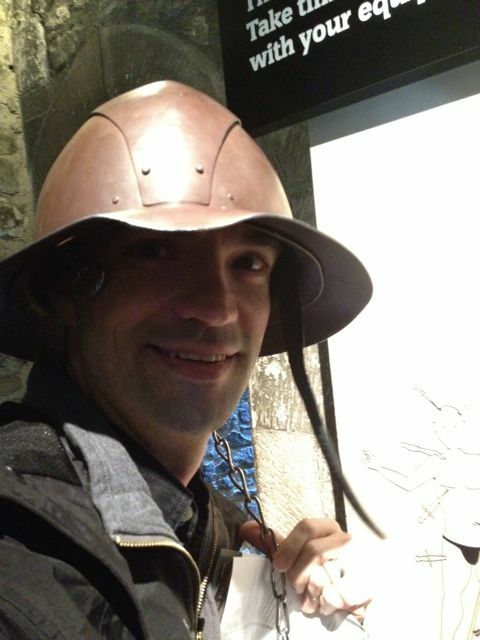 Robby wearing a replica of a medieval soldier's helmet. 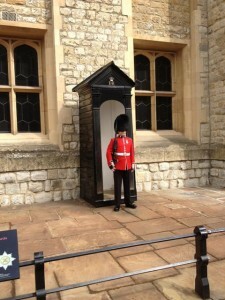 Irish Guardsman outside the Crown Jewels. We found a fairly swanky restaurant for lunch, and built up our strength for a trip to Westminster Abbey. 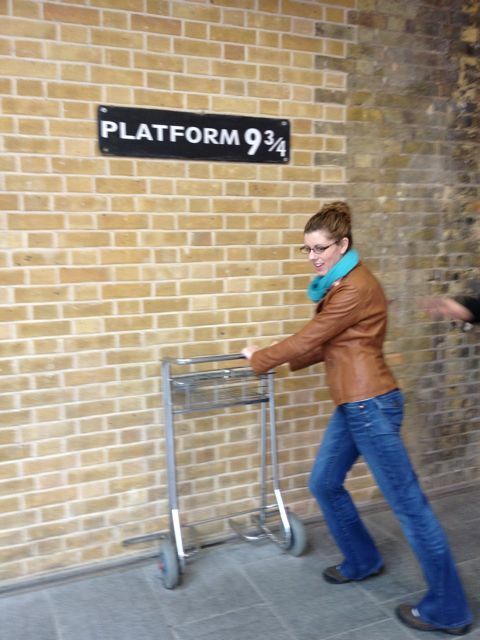 We spent some time looking at all the monuments and tombs, then took the Tube up to King’s Cross Station to hunt down platform 9 3/4. We rounded off our day with a dizzying trip to Topshop (a UK clothing store similar to H&M) before heading back to the hotel to rest a bit before dinner. Our plan was to walk toward the Millennium Bridge and St. Paul’s cathedral and find some dinner along the way, but we were soon stopped by a downpour. We took shelter in a pub, which had unfortunately stopped serving real food for the evening. Thus, we ended up having potato chips for dinner before staggering back to our hotel and falling into bed. 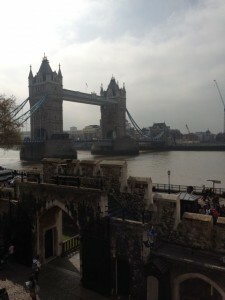 Sort of a weird way to end our time in London, but the day overall was pretty great–I just wish we had had more time! Sadly, Robby and I had a pretty early flight back to LA on Saturday morning, so we had to wake up early, pack up our stuff, say our goodbyes to Ashley, and catch the train to Heathrow. 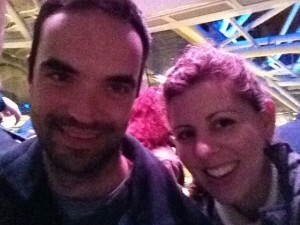 Thankfully, our flight back to LA was uneventful (though sooooo long! ), and we made it home around 4pm on Saturday (LA time). Lucy was super excited to see us, and we were happy to be home! 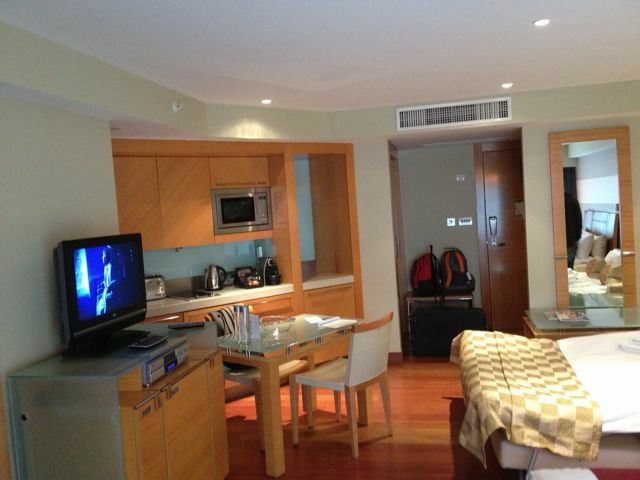 Our 3 amazing hotel rooms. Robby planned our travel, and he did an awesome job with the accommodations! Shopping at the Prada store and getting an amazing wallet. 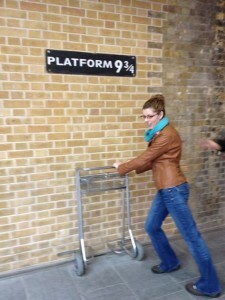 I felt a bit like Julia Roberts in Pretty Woman. Seeing historic sites in Rome. My one and only cup of gelato–stracciatella and coffee flavors! 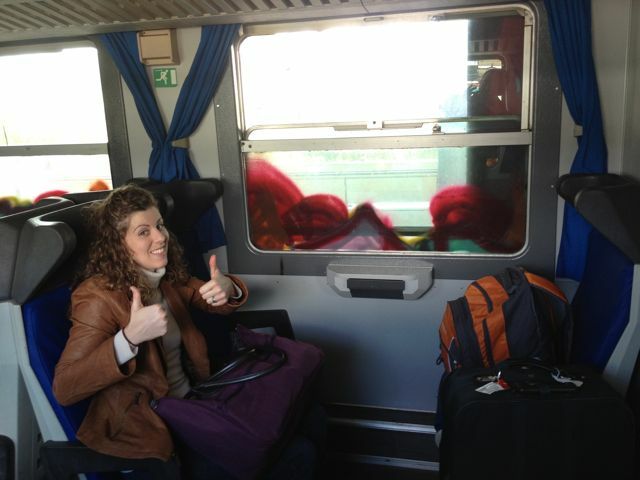 Getting to ride the high-speed train in Italy. Seeing the Tower of London and Westminster Abbey. There were a few things I wish had gone differently (sickness, obviously, as well as cold, rainy weather and lots of time spent travelling to and from different places), but I guess that means Robby and I will have to go back sometime and see more of Italy and London. I’m definitely ok with that! It was great seeing you guys this weekend, and I hope that we can meet up again soon!